Indian banks, primarily the public sector banks, are on the verge of a financial meltdown. The reason is the ever increasing burden of non-performing assets (NPAs) or bad loans. In the second fortnight of February, bank after bank reported sharp dip in profits. Desperate, the Reserve Bank of India (RBI), the Union Ministry of Finance and the Supreme Court immediately swung into action. The apex court directed the government to submit a list of defaulters while the central bank put a deadline of March 2017 to banks to clean up their balance sheets. Highlighting the situation, RBI Governor Raghuram Rajan said it is a condition that requires deep surgery, not band-aid treatment. But hidden in this turmoil is a fact that the country is just beginning to talk about. In a rush to clear projects, banks grossly faltered in doing due diligence in assessing projects sanctioned between 2010 and 2015 on their environmental and social impacts. And as companies faltered on loan repayment, banks restructured the loans and offered additional funds. While it is difficult to predict the percentage of NPAs due to projects stuck in social conflicts, there are strong pointers that suggest the conflicts have significantly contributed to the current mess. The gross NPAs of scheduled banks increased to 5.1 per cent of gross advances between March and September 2015, according to RBI data. The information on the central bank’s website shows that as on June 2015, the gross NPAS of scheduled commercial banks was Rs 329,803 crore. This is 18.6 per cent of the estimated total expenditure announced in the Union Budget for 2015-16. The State Bank of India, the largest lender, announced a 61 per cent drop in profits for the third quarter of 2015-16 and warned NPAs would remain a problem in the next quarter. A higher provisioning for bad assets and contingencies dragged down Punjab National Bank’s net profit by 93 per cent to Rs 51 crore, while Canara Bank’s profit eroded by 87 per cent to Rs 85 crore. Out of the 39 listed banks, 30 have reported third-quarter earnings till mid-February. Data shows their NPAs have risen by 26 per cent between September and December 2015. The net profits of the listed banks went down by 98 per cent to Rs 307 crore in the December quarter from Rs 16,806 crore in the year earlier. The public sector banks that account for a major chunk of the total NPAs have reported a combined loss of Rs 10,911 crore in December 2015. Bad loans started accumulating in banks as early as 2013. They were mostly loans taken by the infrastructure and mining sector companies whose projects either got stalled or faltered on economic viability aspects. According to non-profit Rights and Resources Initiative (RRI), by December 2014, total bad loans of listed banks was Rs 4.85 lakh crore, which is nearly 14 per cent of the total loans given by all banks or the total net worth of the banking sector. According to RBI’s Financial Stability Report of December 2014, infrastructure, iron and steel, mining, textiles and aviation sectors accounted for 52 per cent of NPAs and restructured loans in scheduled banks by June 2014. While social risk assessment is an integral part of loan appraisal by multilateral lending institutions, Indian banks, barring a few, do not undertake significant assessment on these concerns. Securing environmental clearance is the last threshold for any project in India to receive bank funding. This is the reason several projects were delayed or scrapped even after securing environmental clearance and a bank loan. Take, for instance, the Nagarjuna thermal power plant in Andhra Pradesh’s Sompeta town that got an environmental clearance in 2009. In 2010, residents of the villages that depend on the wetlands in the region started protesting the project. The National Environment Appellate Authority suspended the clearance for the project in July 2010 after three protestors were killed during a protest. In July 2012, the National Green Tribunal said the suspension of the environmental clearance will continue till the time its directions are complied. Finally, on 29 August, 2015, the state government cancelled the land allotment for the power station and directed that the land can be used only for agri-based industries. Meanwhile, the company had spent Rs 1,300 crore. 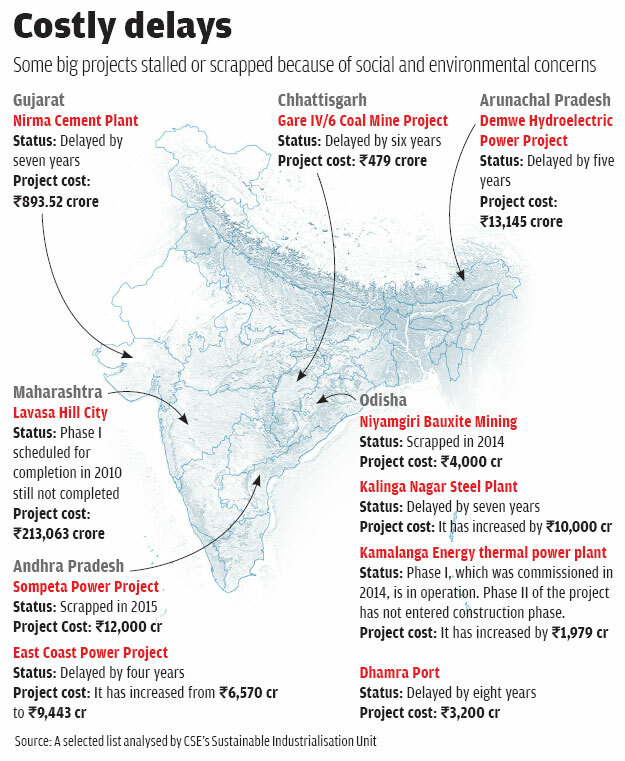 The estimated cost of the 2,640-MW power project was Rs 12,000 crore. The company planned to have a debt-equity ratio of 3:1, which means the debt component would have been Rs 9,000 crore. Another example is the Tata Steel’s Kalinga Nagar project in Odisha. The company and the state government signed a memorandum of understanding in November 2004 for setting up a steel plant with a capacity of 6 million tonnes per annum (MTPA). The project, estimated to be worth Rs 15,400 crore, got delayed by seven years because of farmer protests. The delay, according to an analysis by CSE, increased the project cost to Rs 25,000 crore for the first phase of 3 MTPA (see ‘Costly delays’). “Banks can play a more powerful role than the environment ministry and state pollution control boards in ensuring compliance on social and environmental grounds. They give the money and have the power to stop funding if a project is found to be non-compliant,” says Sujit Kumar Singh, programme manager, Sustainable Industrialisation Unit, CSE. However, there are no binding guidelines for banks to conduct due diligence for a project. The RRI report says that the central bank does not regulate due diligence by banks beyond forbidding loans purely for land acquisition. There is also no explicit requirement from the Securities and Exchange Board of India (SEBI) to disclose regulatory compliance or the status of clearances, the report says. 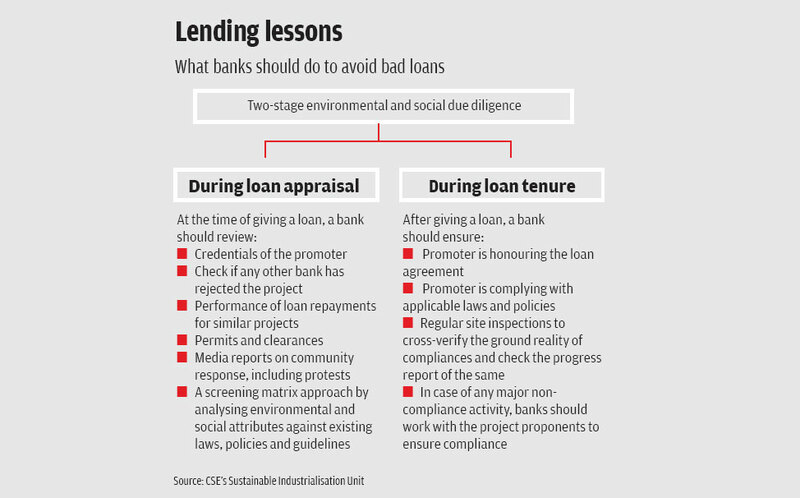 A 2014 report by the Programme for Social Action, Down the Rabbit Hole—What the Bankers Aren’t Telling You!, says most banks’ internal loan policies are uniform in ignoring social and environmental risks. “The problem is that the assessment of the commercial viability of any project by the banks does not take into account the environmental and social concerns, which may lead to regulatory hurdles. Eventually, the banks end up funding commercially unviable projects,” says Shankar Gopalakrishnan, president of the Campaign for Survival and Dignity, a national platform of tribal and forest dwellers’ organisations. It is difficult to predict a bad asset, but overlooking environmental and sustainability implications while appraising projects is like burying one’s head in the sand. “It is imperative for banks to see the environmental and social considerations of the projects are adequately addressed,” says Singh. He adds that Japan Bank for International Cooperation has made environmental and social impact assessment mandatory for loan approval. The bank also conducts an independent review before making a funding decision and monitors after the funding is started (see ‘Lending lessons’). Banks in India can also take their cue from Equator Principles, a global framework adopted by financial institutions to manage environmental and social risk in projects. Under the Equator Principles, financial institutions require the client to set up a grievance mechanism that would involve aggrieved communities in finding amicable solutions. Only a few financial institutions in India, such as IDFC, are signatories of this global framework. Some experts also recommend a law to regulate and monitor corporate loans and project finance loans on the lines of “public accountability, transparency and compliance with social, environmental and sustainability safeguards”. Banks cannot entirely wash their hands of the responsibility by saying that environmental and social concerns cannot be fixed into their financial structure, says Lakshmi Premkumar who authored the Programme for Social Action report.